— A little over three years ago I met a girl online, who had one thing in common with me, which was our love for a British boy-band named One Direction. While in the beginning our relationship was merely based on this mutual interest and took place on public social media like Twitter and Tumblr, we became closer over time and now she is one of my best friends. The distance between us is about 450 km or a two hour flight, but I couldn’t think of anyone that knows me better and has been as supportive and loving for the past three years as she has been. Although our lives are very different and we might not fit perfectly into each other’s worlds, we manage a strong friendship. Sometimes I think that without distance between us we wouldn’t be as close as we are now. But this is not the case for everyone, most people struggle with the distances that separate them. Comparing my own long-distance relationship to some of the stories that I heard from others made me think about how special long-distance relationships are and how much variety is among them. Just like any other relationship, long-distance ones come in many shapes and sizes. With different starts and finishes, different people on each side of the line, different connections between them and stories to tell. Over the past decades the relative distance between people has decreased significantly due to advances in technology and communications. How connected or disconnected we are over large spaces has become more effortless and less time consuming, but that does not mean that it is easy. 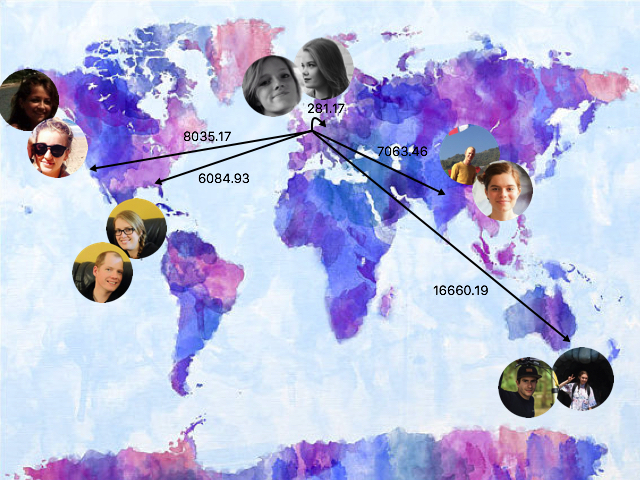 This piece aims to tell five different stories of people all over the world that maintain a relationship over a long distance. From friendships to family relations and couples with thousands of kilometers between them, every story is unique and fascinating in its own right. Friendships are not defined by the moments you see each other and distance doesn’t have to be an obstacle unless you allow it to be. These are nice things to say, yet they are not so often truly tested and when they are, it is usually friendships turning long-distance after years spent in proximity. All the more impressive therefore is the friendship between Gina Melis and Josh Muncke, who have physically seen each other once in their three year friendship and are 16,660.19 km away from each other. Josh, who lives in Sydney, Australia, and Gina, who lives in Utrecht in the Netherlands, met through Twitter roughly four years ago. They shared an interest in music and in particular a band, Forever Ends Here, that consists of some of Josh’s friends. After a few months of contact online, Gina went to Australia for an internship and she met all of the band members and Josh in person. “I talked to these people from the band almost every day for a few months, and then I had to do an internship in an English-speaking country, so I went to Australia because I knew them,” she explains. Meeting in person obviously had its differences from the friendship that Gina and Josh had online. “When we first met in real life, we were kind of figuring out how to interact on a face to face basis as opposed to screen to screen,” Josh says. “You kind of hold yourself back when you speak in person as opposed to when you’re behind a screen,” he explains. The differences were noticeable in how they spoke, but also in how they acted together. “When you’re closer you’re more likely to spend time with each other and do fun things together, whereas we can only talk.” Gina says. Because of the great space and time difference between them it is difficult to Skype, and the most substantial part of their relationship consists of talking to each other through email and chat. “You’re getting to know each other in a different way; because you’re so limited in the actual physical connection, you have a much more emotional one,” Gina says. Gina’s visit to Australia showed both of them how their friendship could be without the distance, but also how it could carry over it. “Especially when I was younger, I didn’t have such a need to hold friends close, so I felt like the friends that were closer were more important,” Josh says. “But luckily for me, she made it all the way to Australia and proved me wrong!” he adds, laughing. After this visit their conversations turned away from public communication on Twitter to more private forms of social media, and the friendship between them developed to the strong bond they have right now. Technology has enabled them to maintain their relationship over such a long distance, but there is still a large time difference between them. “Usually when I message him we will talk for a week,” Gina says, “That sounds weird, but it is because I get only one or two messages a day and then I am asleep,” she explains. This means that it still takes quite a lot of effort to keep their communication alive and to keep updated on each other’s lives, yet neither of them misses being on Twitter, a medium where you can see more moment to moment updates on someone’s life. “It was a really big part of my life but I want to focus on what I have here as well,” Gina says, “It is good to have a life here, rather than only having a life on the internet with people who are not physically close to you,” she states. .
Their relationship has grown to be stronger than some of the relationships they have with friends at home. “I can hang out with my friends for days on end and talk about bikes, movies, things we see on the internet but it is hard, especially for guys to openly talk about how they feel,” Josh says. “With Gina I can talk about that kind of stuff,” he continues. After Gina’s first visit to Australia the two friends made plans for Josh to visit Europe, but unfortunately that didn’t work out at first… until now that is, as Josh got three weeks off work to visit Gina and “smash a cruiser for sure! *” while in the Netherlands. *HAVE FUN ON A RECREATIONAL BIKE (TRANSLATION PROVIDED BY JOSH MUNCKE). Maintaining a friendship over a long distance is difficult, but maintaining a love relationship is possibly even more challenging. Yet Han Kop and Carla Ott have managed it for over three years running. For most of the year Han lives in Nepal and India, while Carla resides in Amsterdam. They spend time together whenever they’re able to, but it still means that most of their time is spent with a distance of roughly 7,000 km between them. Long-distance family relationship aren’t uncommon but can sometimes be very difficult, especially when the separation happens after years of living together as a family. Cor and Johanna, brother and sister, spent their lives growing up together in ’s-Gravenzande. But in August of 2008 this changed when they decided to move to Canada as a family. “My dad always wanted to move to Canada, but only if we were going with the whole family,” Johanna says. The whole family went to Canada but Cor moved back to the Netherlands after a year when his visa expired, creating a gap of 6,084.93 km between him and his family. Despite the large distance, the relationship between Cor and Johanna is very strong. “I am closer to Cor than I am to my younger brother who lives here in Canada because we have more in common,” Johanna says and Cor says: “We both have a family and children, I like to cook, Johanna likes to eat it, and when we are together we like to cook and bake together.” They stay in touch through weekly Skype calls and WhatsApp chat on which they share pictures of the children. “Our children know them and their children know us, so for the kids it is really normal and they know that they are part of our family,” Johanna says. For the siblings the distance between them has become part of life. “You get used to it,” Cor says. “We got used to being in front of the webcam and sharing normal, every-day things,” he elaborates. When they speak to each other on Skype their conversations are no different from the ones they have with friends that are closer. “We talk about normal every-day things,” Johanna says. “It is not like calling a friend because we talk every week and we know everything that is going on, I probably see him just as much as my family here in Canada, just through a webcam,” she explains. Despite these difficult moments there are also some minor positivities about the distance between them. “You really appreciate moments much more when you are together; normal things for other people are really special for us,” Cor says. But the benefits don’t really weigh up against having to miss their family. “We hardly ever fight, but that is the only benefit, because I would really really like him to be closer,” Johanna says. In some cases of long-distance relationships the element of distance can be a connecting factor. Cissy and Elisa met roughly 18,000 km away from their homes when they both went to New Zealand to work as au-pairs. Back home in Europe they live only 281.17 km away from each other, but have yet to meet each other in person again. Cissy and Elisa met through their jobs as au-pairs as the children they worked with were of similar age and had similar interests. “My au-pair manager told me there was a new au-pair coming to my neighbourhood and she gave me her number, we talked a little on chat and then I brought my kids to ballet lessons and suddenly Elisa was there too,” Cissy says. They spent quite a lot of time together and became friends quite easily. “It was pretty easy to build a strong relationship because we were both taken out of our everyday life, we were both without our best friends and family so we kind of stuck to each other,” Elisa says. The distance between them has known many different lengths. They met in the same city and spend roughly 6 months together before distance first became a part of their friendship. Cissy left New Zealand earlier than Elisa, and travelled through Asia before going back to Europe which meant the distance between them was constantly changing. “When she was in Asia she was telling me about her travel experiences and when she was back home she told me about things that happened back home, but our friendship was still the same, there were just different things to talk about,” Elisa says. Both girls are very much interested in travelling, and they share their travel stories with each other as well as make plans for future trips together. “For me Elisa really is like a travel buddy,” Cissy says. “If I ever go somewhere and I’m looking for someone to go with I would ask her because I know what to expect from her and she knows what to expect from me.” The two girls travelled together through New Zealand before and they often share the stories of their own travels with each other. “We always exchange our experiences and I love to read her blog whenever she updates it,” Elisa says. A part of this passion for travelling is also that the girls send each other postcards from the places they travel to. “When you get a postcard you get really excited, so it is nice to send them,” Cissy says. They met each other every year during holidays in Canada where their entire family came together, consisting of six sisters, two brothers and their children. “My best childhood and teenage memories happened with my cousins, especially in Vancouver,” Alice recalls. Apart from it being a moment when they would see each other in person, it was also something that created a bond between them. “We’d just talk from January onwards about how excited we were to go to Canada, it was just this shared love we had of this place where we could be with family,” Lucie says. As both girls entered their teenage years they connected on social media and a sisterly bond developed between them. They speak regularly, mostly on Facebook chat and occasionally through Skype when they’re joined with one of their Canadian cousins. Although the distance between them was shorter in the past they are less bothered by it now, as it is just part of their relationship. “When I was 14 it felt like a really big deal when we would not see each other for 8 months, but now it just feels normal,” Alice says. Despite being used to having a large distance between them, there are still sometimes difficult moments. “You do sometimes feel like you miss out on some things that are going on,” Lucie says. “Because I’m not there and she would’ve told me if I was with her first, but she might not have thought to message me on Facebook about it,” she continues. Alice and Lucie have a friendship that is seemingly easier than with any of their other friends. “I feel like I put a lot less effort into this relationship than I do with friends,” Alice says. “I guess cause you’re cousins it is a different kind of relationship; you’re friends but you know you don’t have to keep maintaining it all the time because you’re always going to be cousins,” Lucie adds. The family bond they have will continue to keep them together and they try to meet each other whenever they can. “I try to see Lucie when I come back to Europe, last summer I saw her three times; in Amsterdam, in London and I went to Spain with her,” Alice says. These moments of meeting each other after a long time is what they see as one of the most beautiful things about their long-distance relationship. “When we are together it becomes a really precious time, especially when she would come here because we would usually be together in Canada, so it is a special thing.” Lucie says.